If your name appears on this list, you're a winner in the 2016 SUPER HUGE Michigan Wine Month Giveaway! Click through to see the full list of winners and read the rules on claiming a prize. Winners have 48 hours to email us at cort@michiganbythebottle.com to claim their prize before we will redraw. That means you need to be checking daily to see if you're the lucky winner for the day … we always feel bad re-drawing, but we'll do it if we have to! Don't make us do it! Sponsor/Prize: Black Star Farms: A one night, midweek stay at the Inn (dependent upon availability), a winery and farm tour, lunch at the Hearth & Vine Café (opening 7 days a week after Memorial Day weekend) and an expanded VIP tasting in the exclusive Barrel Room. Sponsor/Prize: St. Ambrose Cellars: A stainless steel 64 oz. St. Ambrose growler + 10% off the first fill of any of their 12 products on tap. Sponsor/Prize: Verterra Winery: A vineyard tour for up to 6 people, along with a complimentary wine tasting, June -October. Sponsor/Prize: Chateau Grand Traverse: Wines of the Great Outdoors package: includes a zip-up hoodie, two campfire mugs (perfect for sipping wine fireside!) and a multi-tool (includes corkscrew, flashlight, etc.). Prize will be mailed to winner. Sponsor/Prize: Westview Orchards Winery: Two spots at one of Westview's monthly Thirsty Thursday wine and food pairing evenings, held on the third Thursday of the Month. Offer expires November 30, 2016. Winner (REDRAW): Susan K. Bernath Tomasek-Swan (CLAIMED)! Sponsor/Prize: Domaine Berrien Cellars: Two tickets to one of Domaine Berrien Cellars' 2016 Lunch with the Winemaker events (a $60 value). Depending on ticket availability, there are six dates that the winner can choose from: 5/28, 6/25, 7/9, 8/6, 9/10 or 10/1. 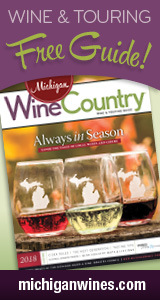 Sponsor/Prize: Ciccone Vineyard & Winery: Certificate good for bottle of wine and two tastings, to be used at the Ciccone tasting room on Leelanau Peninsula. Offer expires at the end of the year. Sponsor/Prize: St. Julian Winery: Each winner will receive a VIP Experience at St. Julian, including barrel tasting, tour and an intimate, in-depth education on the winemaking process from bud-break to bottle. Sponsor/Prize: Chateau Chantal: Admission for two for a Chateau Chantal Sensory Tour. This new tour touches all five of your senses and will prove to enlighten your palate, your spirit, and your mind! In addition to your sit-down tasting focusing on how wine interacts with your senses, your specialized tour guide will lead you through our vineyard, cellar, and winemaking process. Once in the cellar, you'll enjoy 5 small-bite food and wine pairings designed to treat your taste buds. Offered daily Mid June – Labor Day. Certificate good for admission will be emailed to winner. Sponsor/Prize: Brys Estate Vineyard & Winery: A Brys Estate VIP Pass, which entitles the winner to two souvenir logo glasses, two complimentary wine tastings, a complimentary five-item cheese and charcuterie board, and two complimentary glasses of wine — a $55 value!